K hukha has been extremly fortunate to have some of the most honourable individuals who devoted their valuable time and resources to develop and achieve immense benefits for the Khukha community. Khukha community has always been and will be proud of Haji Noor-ul-Hassan's achievements and services since he was a great benefit for the whole Khukha community. H aji Noor-ul-Hassan's main achievements include the foundation of boy’s middle school and especially the Girls High School Khukha. He was the first person to graduate from University of Punjaab. May Allah reward him Jannah for his kind efforts. 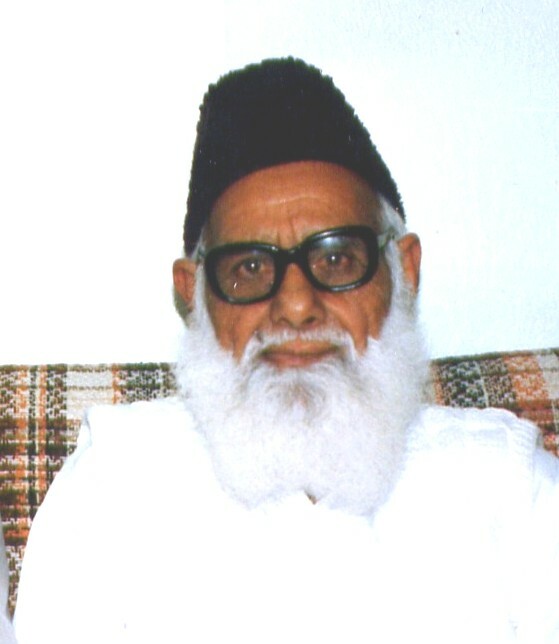 Choudhary Haji Noor-ul-Hassan was born in Khukha in 1908 and his father Haji Hayat Bukhash took keen interest in his education. There was no primary school in Khukha and young Noor-ul-Hassan had to walk over 10 Km, about 6 miles everyday to Rohtas. He passed 8th class with distinction and his father sent him to Government High School Jhelum for further education. After matriculation from Jhelum, he moved to Lahore. He became a primary School teacher and continued his studies part time. In 1938 he graduated from the PUNJAB UNIVERSITY. He obtained B.T degree and was offered Government services. He was also offered Army Commission but instead he chose to work for Dina School and he founded the PUBLIC HIGH SCHOOL at G.T Road Dina (Now the Government Higher Secondary School Dina). Government Higher Secondary School Dina has a tradition in educating the students of not only Dina but also students from the surrounding villages have benefited from this great seat of learning. Dina higher Secondary School has produced teachers, Professors, Army officers and other professionals who has introduced the name of Dina and Choudhary Haji Noor-Ul-Hassan throughout Pakistan. Immediately after retiring from service, Choudhary Haji Noor-Ul-Hassan founded the Girls Secondary School at Khukha in the early 70's. This is also a highly successfully institution and thousands of Girls from Union Council Khukha and surrounding villages have already matriculated from this School. Choudhary Haji Noor-Ul-Hassan was a keen educator and believed that all children regardless of their parents status should receive basic education. He was always over joyed at the success of his pupils and Dina and Khukha distric owe a great debt of gratitude to Choudhary Haji Noor-ul-Hassan. Over the recent years Government Higher School Dina has been almost entirely rebuilt and old students and residents of Dina Tahsil generously contributed towards the rebuilding of this great institution. ................ Writen By: ATIF AYUB CHOUDHARY.